When Kyra, the Moorigad dragon-shifter, unwittingly finds herself at Mystic’s Carnival, a supernatural world between realms, she believes her runaway days are finished. Amidst the carnies and never-ending magic, she finds a home of the heart – friends and belonging among a gathering of paranormal beings. However, living an uncomplicated life was never one of Kyra’s strengths. She’s falling for her all-too-secretive best friend, Sebastian. And as she delves deeper into his mysteries, her goodwill sabotages their future and her very existence. Can Kyra and Sebastian find their happily-ever-after? *Now you can get the complete story with all three books-in-one, including additional chapters. 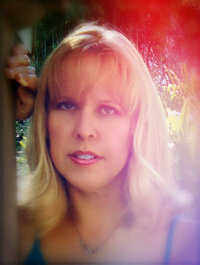 Debra Kristi is a paranormal and fantasy writer. She lives in Southern California with her husband, two children and and three schizophrenic cats. She’s a full-time kid chaser, video game maker’s wife, and muse prompted writer. Unlike the characters she often writes, she is not immortal and her only super power is letting the dishes and laundry pile up. When not writing, Debra is hanging out creating priceless memories with her family, geeking out to science fiction and fantasy television, and tossing around movie quotes.